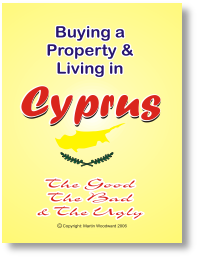 If you’re thinking of buying a property in Cyprus my e-book could save you thousands of pounds, as well as informing you of the many dangers! I’ve bought and sold 2 properties and lived and worked there for 3 years. I also started and later sold my own business. Don’t fall foul to the property developers. My guide explains how to get it right! Even after a great deal of research we made a mistake that cost us over £2000 (just a little nasty in the contract which could have easily been avoided). Ever wondered how much it costs to live there? My e-book will tell you down to the last penny how much it cost us for a year (2 people + car + cat + dog) in a 3 bed villa with pool including all insurances, heating/electric costs, eating out etc. I have also included details of the final extras bill on our villa purchase which ended up being nearly £50,000 (sterling), yes that’s just the ‘extras’. If you’re shocked, just think how we felt! Note This is item is now a few years old, so some of the info is a little dated, but most is still relevant and of course you can still contact me. Until a revision is made the price is reduced to FREE. Instant Download Version - FREE!! !